Mailbag: Guns, Grief And Getting It Right After Orlando Shooting : NPR Public Editor Listeners share their concerns about NPR's coverage of the mass shooting in Orlando. People hold candles during an evening memorial service in Orlando for the victims of the Pulse Nightclub shootings. As the magnitude of the Pulse nightclub shooting in Orlando, Fla., began to emerge Sunday morning, NPR's newsroom quickly mobilized; by 6 a.m. ET, initial plans were taking shape. Later in the morning, the newsroom moved into the live reporting known as "special coverage" for those stations that chose to air it. As is common with big news stories such as these, listeners were divided over NPR's decisions. NPR did not move to full coverage quickly enough for some, while others, such as Susan McClear of Sitka, Alaska, objected to the special coverage that "does nothing more than glorify violence when 'it's early days' 'we don't know yet' 'the authorities can't tell us' etc. etc. is all that you can really provide." Here's an explanation of how these decisions come together that the newsroom provided at the time of the Paris attacks last fall. Many listeners have been moved by NPR's reporting from Orlando in subsequent days: a sensitive interview that Ari Shapiro did with someone who lost a friend, his profile of the youngest victim, and Adrian Florido's profile of a young Puerto Rican-born man who lost his life. Listeners and readers have also weighed in on other aspects of the reporting, including an error. Here are some of their concerns. At 9:22 a.m. Sunday, an email came in to the newsroom from a Boston-area listener wondering "How is it not relevant" that the Pulse nightclub where the attacks took place was a gay club? Listener Mica Warton called it a "serious omission," adding, "Fix it." NPR had indeed reported that it was a gay club in the 7 a.m. newscast, but not in the 8 a.m. or 9 a.m. newscasts. I highlight the concern because it was just one of a number from listeners that I would categorize as wanting NPR to be much faster to point listeners towards what the shooting meant. Even as reporters were still trying to get basic facts from authorities and witnesses, such as how many people were killed, my office was receiving emails from listeners who wanted NPR to be clear whether it was a homophobic attack, ISIS-inspired terrorism or a direct result of U.S. gun access policies. This pressure is a direct result of the lightning speed with which news now travels, at least for those on social media. It is exacerbated by the punditry that cable news networks use to fill their many hours, and the highly politicized atmosphere fostered by the presidential campaign. The problem, of course, is that all the information necessary to put any event such as this in context is not available in the immediate aftermath, and sometimes not for days. Four days later, a full profile has still not emerged of what drove the shooter to kill 49 in the Pulse nightclub. It may likely be a combination of factors. For more thoughts on this pressure, including those of NPR's senior vice president of news, Michael Oreskes, see this CJR.org article and a column by Margaret Sullivan of the Washington Post. Oreskes also discussed this issue Sunday on CNN's "Reliable Sources." My office is still receiving emails from listeners who believe NPR deliberately chose to underplay the fact that the attacks took place in a gay nightclub, and continues to do so. Mark Memmott, NPR's standards and practices editor, told me that "like in the early hours of any event, it took awhile to figure out what to say," as reporters scrambled to confirm numerous details about what happened. He added, "I don't think it can be said in our coverage that we were not very clear about the nightclub." I agree. Several listeners wrote to complain that some NPR reporting mischaracterized one of the guns that law enforcement officials initially said was used by the shooter. (Officials first said the gunman used a handgun and an "AR-15-type" rifle; an Associated Press correction now reports the rifle was a Sig Sauer MCX, which is similar but not the same.) The listeners were right; an AR-15 is not an "automatic-style weapon." As NPR's online article explained, it is a semi-automatic, releasing one bullet with each pull of the trigger. NPR called it an "assault rifle" a number of times. But that designation, while widely used elsewhere, is also to be avoided. According to The Associated Press, while the "precise definitions may vary from one law or jurisdiction to another," the "assault rifle" description is used by some to designate a gun meant for military use; the AR-15 family of guns was developed for civilian use. Some argue that the distinctions between guns made for military and civilian use are "disingenuous" but NPR's preferred style is to call such weapons "assault-style" or "military-style." Mistakes when referring to weapons are an all-too-common occurrence when NPR is reporting on these kinds of attacks, although listeners picked up on fewer slip-ups this time than in the past. Memmott has issued repeated guidance on the description of weapons to the newsroom, cautioning reporters to be careful about these descriptions, and he said he issued another internal reminder Tuesday. Later in the week he also posted another online reminder. One other thought from me: While those who are familiar with guns or steeped in the debate over access to them are well aware of all these distinctions, I am certain many other listeners and readers are not. A far better practice might be to take a couple of extra words and describe with some specificity what the guns in question do. Not "The Deadliest Mass Shooting In U.S. History"
Part of the job of a journalist is to put a story into perspective. So the inclination to rank where the Orlando shooting fell on the list of "deadliest mass shootings" was understandable. But journalists who venture out to call something the "biggest" or "fastest" or "first" invite criticism. 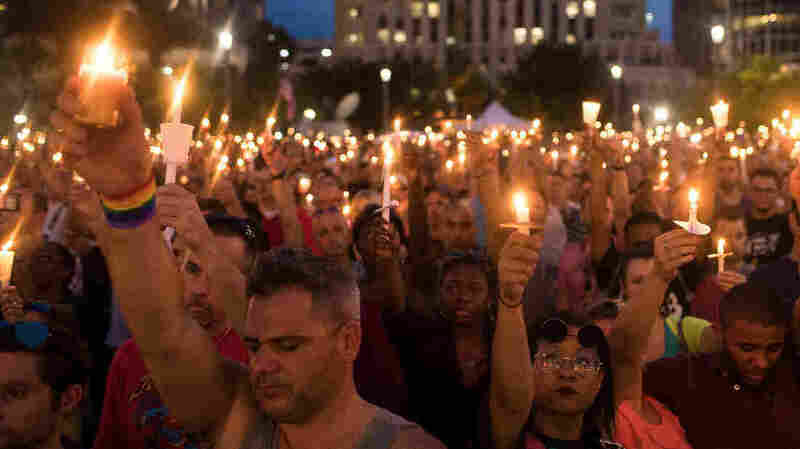 Readers and listeners indeed reacted swiftly to NPR's repeated characterization of the Orlando shooting as "the deadliest mass shooting in U.S. history" and an online article that seemed to back that up. As they pointed out, the characterization only holds true for recent mass shootings, and ignores an entire swath of earlier U.S. history, including numerous mass killings of Native Americans and African Americans. I applaud the newsroom for following up quickly with a second article that acknowledged these concerns and tried to put the shootings into a broader historical perspective. That article concluded that it was more appropriate to call the Orlando shooting the deadliest in modern U.S. history. Many commenters remained unhappy even with the follow-up and still felt the list marginalized other such events. Why compile such a list at all? Many readers seem to believe it was meant to convey the event's magnitude compared to other such tragedies on a sort-of "grief meter." Then I would agree that it made sense to include all such historical events, or better yet, not rank them at all. As one commenter noted, "Why can we not acknowledge a tragedy without pretentiously qualifying it?" Moreover, as numerous commenters have pointed out, limiting the list to "shootings" ignores other tragedies such as bombings and fires. Or, by singling out shootings, was the list meant to give the audience information and context needed to form their own opinions about one aspect of the unfolding story, the debate over U.S. policy on buying and selling firearms? If so, it does make sense to limit the scope to more recent events. But, as a recent Washington Post article notes, how to define what qualifies as a mass shooting is an object of debate, with multiple definitions in use. One shooter or two? Did the event take place in a public space? Should the tally include only those killed, or those injured as well? Bottom line: The newsroom waded into murky waters. There would have been nothing wrong with calling this one of the deadliest mass shootings of recent times and leaving it at that; alternatively, while journalists like to default to shorthand, in this case more precision about what exactly was being ranked would have avoided the problems. Either way, NPR should stop using the "deadliest mass shooting in U.S. history" designation, as it did even as late as one Tuesday headline. NPR received some kudos in the journalism community for an online disclaimer that it used (and often puts on breaking news stories) that says: "This is a developing story. Some things that get reported by the media will later turn out to be wrong. We will focus on reports from police officials and other authorities, credible news outlets and reporters who are at the scene. We will update as the situation develops." The progressive group FAIR.org, which monitors media bias, singled out one mistake that did indeed take place in the live "special coverage" portion of NPR's reporting. Discussing concerns about the theoretical implications of a terrorist attack happening in advance of the U.S. November elections, NPR's counterterrorism correspondent Dina Temple-Raston incorrectly characterized a similar historical situation, saying that voters re-elected a conservative government in the wake of the 2004 Madrid bombings, when in fact a socialist government was voted in. NPR has posted an online-only correction, along with the original audio. FAIR argues that NPR should put the correction on air, as well, and that the correction should do more to explain the context of the error. Memmott, who handled the correction, told me by email: "No mistake is minor, but her mistakes were not about the terrible news of that day. She was noting that there had been an attack in Spain just before one of its national elections and that officials are worried about such an event happening in the U.S. this year. Those are the important points. It is unfortunate that she was wrong about which party won the Spanish election, but should be put in context with all the reporting we were doing that day." He added, "I think the correction addresses both mistakes that were made." As for not putting the correction on air, here is the newsroom's rationale, again from Memmott: "On-air corrections are most effective when they have a chance of reaching the audience that heard the mistake. There is no 'show' on which to broadcast such a correction because the mistake happened during live, special coverage." He added, "Obviously, if we feel an error is of such magnitude that it needs to be corrected on-air as soon as possible, we will do that and not worry about whether it was made on the same show. An example would be mistakenly reporting someone's death." And his final point: "Putting a correction online and attaching it to the audio that has in it the mistake are not minor steps. We've been very transparent." In the wake of Sunday's shooting, a number of listeners have asked NPR to stop using the name and (online) the photo of the shooter. These requests come in every time there is a similar event; I wrote about it previously. Memmott told me, "We have talked about it throughout this event. Our thinking is that not saying his name is omitting a historical fact. That said, we understand the theory about how repeating the name over and over, and putting his face on stories again and again, can lead others to want to emulate a killer. We also know that people want to hear about the victims, the doctors, the first responders, the families, etc. — and that we need to do those stories and make room for them. Being judicious about coverage of the killer is important and helps us focus on those other stories." In an interview with All Things Considered, Zeynep Tufekci, an assistant professor at the University of North Carolina, Chapel Hill, argued not that news organizations never identify a mass killer by name, but that they should "develop sensible guidelines so that the coverage of such mass shootings is not done on the killer's own terms." It is a suggestion I believe is worth exploring. This post has been updated to include links for more context.